I got Basil my freshman year in college when I was living in Northgate and going to Cornish – would have been early in 1998. I really missed having animals around having grown up with pets and was also feeling kind of isolated living out there so far from my classmates. 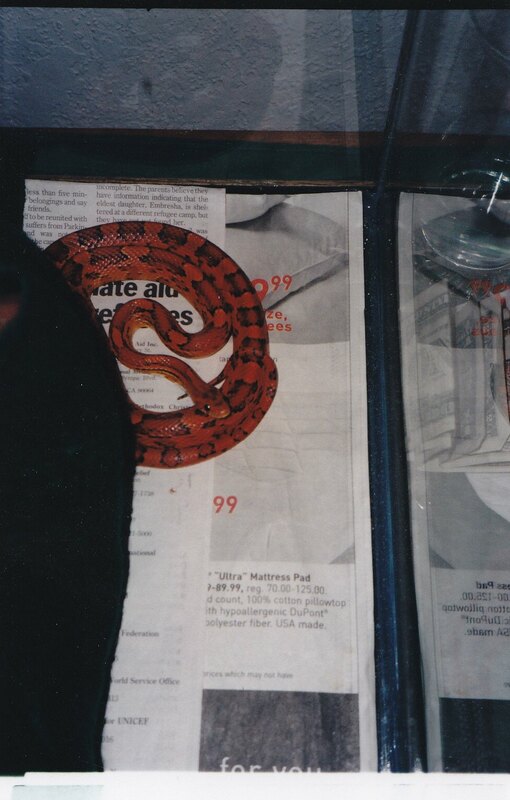 I had always loved snakes, but never had one and kind of on impulse one day I went to a pet store that was on Northgate Way at the time. I didn’t really know anything about different kinds of snakes, definitely not cornsnakes. But I went for it. I didn’t have a car, so I took the bus back to my apartment with Basil, heat lamp, tank that I could barely carry by myself, etc. Basil came home with me for the summer, then the next school year, I moved into a Capitol Hill apartment with a classmate. He was also terrified of snakes, but Basil stayed in my room and Rob could mostly ignore that she was there. Until one day I left the top ajar after cleaning the tank. I was gone at school all day and didn’t notice until late that night that she was gone. My boyfriend and I searched every tiny nook and cranny in my bedroom and the shared space in the apartment, but then had to go tell Rob that the snake was loose. He only panicked mildly… but even after searching his room, Basil was not to be found. So thankfully, Basil’s head was not chopped off and we were reunited, but not long after that I decided I just didn’t have the time I wanted for her and I hadn’t had time to get a stash of frozen baby mice and had had to feed her a live one. I was a bit haunted by the screams of that mouse as it was being eaten. So Polly took her! I’m excited to read about the further life of Basil!